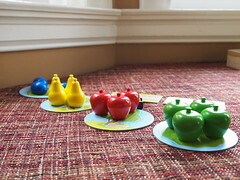 The picture above is of a game, a lovely little game that Sophie loves to play called First Orchard (made by Haba). It was a day of no’s for her, an in-a-minute day, a I-just-have-to-feed/change/rock/take-care-of-Owen/James day. 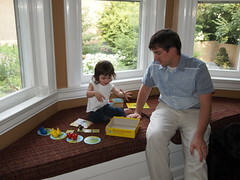 She set the game up, by herself, on our dining room window seat while I was feeding the boys. She set it up perfectly. Without my help. The correct fruits were on the correct trees, the stone path that led to the orchard was perfectly lined up, with the fruit-eating-raven (her favorite part) at the bottom. And she waited. And waited. She picked up the raven, danced it around the window seat and said, “Caw, caw, caw!” And then she waited some more. So patiently. She just sat there, cross-legged, waiting for me—for someone—to play with her. “Now?” she finally asked. But I couldn’t. I just couldn’t. The boys were eating tremendously slowly. I hadn’t even burped them yet. Finally, rightfully, she got upset. All day she had heard no. All day. Andy came home from work before I could finish with the boys. “Play with her,” I pleaded. And he did. Without even changing out of his work clothes first. “Thank you,” I mouthed. I knew, going into this twins-with-toddler experience, I’d feel a lot of guilt. Kids aside, I’ve always had guilt issues. I’m really, really good at it. I think my therapist pointed it out 10 minutes in my first conversation with her (if I remember correctly I was going on and on about feeling guilty that I drove to the appointment instead of walking, given that her office was so close to my house). Lately, though, some things have happened that I feel really guilty about. And so here I’d like to get these few things off my chest. 1. (The worst.) Sophie had just finished painting and needed/wanted to wash her hands. I needed to feed the boys, who were in panic-mode crying at this point. So I got her set up (on the stool, water on, towel and soap in reach). Then I started feeding the boys. Sophie washed. And washed. And washed. Sensing that she was more playing than cleaning at this point, I asked her to turn off the water. She ignored me (so I thought). I asked again. And again and again and again. Finally, I yelled. “Sophie Olivia Uhl, turn off the water NOW!” She started sobbing, uncontrollably sobbing. Frustrated, I stopped feeding both boys (meaning both boys were manically screaming now) and marched to the bathroom. And discovered this: She couldn’t reach the faucet handles to turn the water off. There she was, trying and trying and trying to do as I asked, and she simply couldn’t reach. I felt terrible. I scooped her up and apologized a million times over. And while I know she won’t remember this, I always will. 2. When Sophie was a newborn, I remember holding her, all the time. And not just when she needed/wanted to be held, but also when she was sleeping. I’d hold her for entire naps. I’d sit, on the couch, holding her, listening to music, reading, watching TV or dozing myself. Now I find it a treat to hold Owen or James. Too often it’s, ‘Oh, thank God you’re sleeping, into the swing you go.’ So lately I’ve tried to make a conscious effort to just hold them. But still, I do it far less than I did with Sophie. One, there are two of them. Two, when they do nap, Sophie wants/needs my attention. Three, eventually I need to wash the diapers. But still, I miss that. I want that. And they need that. Guilt. 3. Last week I ventured out to a small park past the cemetery by our house, with all three kids on my own. Sophie was thrilled with this venture. All morning she talked about it. She practically ran the entire way there. And once there, she was, easily, the happiest kid there. And I bet she said, oh, 50 times, “This is so much fun, Mommy. This is really, really fun.” Clearly, I need to be taking her to the park more often. 4. I used to be so strict about Sophie’s TV/computer time. I grew up with 30 minutes of TV/day. But lately, when I’m feeding the boys or pumping, and I’ve told Sophie to color, read books, play with her dolls, build a train, build a tower, do crafts, bounce a ball, dance, sing, play with her musical instruments, run around in circles, chase Tucker, put on my bracelets, play her First Orchard game, line up my nail polish, etc., etc., and her response is always no, no, no, I cave. I turn on PBS. I find Dora and Diego and Wubbzy and Wonder Pets and Yo Gabba Gabba and The Backyardigans and The Fresh Beat Band online. And she watches. And she sings. And she dances. And she’s quiet and not whining and not upset and happy and the boys are happy but ohmygoodness is it way too much TV. Guilt, guilt, guilt. This, Andy and I are both working on. The now-occasional tantrum over us simply saying no to her asking if she can watch the computer is too much to handle. I could write forever on this topic. I know I need to release myself from much of this guilt but some is deserved. And some, I believe, is part of good parenting. Still, I will never forget the image of Sophie sitting cross-legged on the window seat, waiting. Or the feel of her hot, teary cheek against mine in our downstairs half bath. Or how I felt simply holding Owen, and James, and noting how little I have done that. I imagine guilt is something I’ll always battle. I just hope I can, someday, turn it into small skirmish instead. This entry was written by kara, posted on September 16, 2010 at 10:51 pm, filed under Uncategorized and tagged andy, game, guilt, James, motherhood, Owen, Sophie. Bookmark the permalink. Follow any comments here with the RSS feed for this post. Post a comment or leave a trackback: Trackback URL.